The U.S. Bank Visa Platinum is a basic bank credit card offering a zero-interest introductory offer that can save you a considerable amount of money if you have other high-balance, high-APR credit cards. 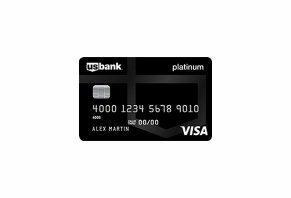 The U.S. Bank Visa Platinum card is a credit card from U.S. Bank that specializes in managing your credit card balances and future purchases through a zero-interest introductory offer. If you’ve never shopped for a zero-APR credit card, then that paragraph might sound a little mysterious to you and that’s okay. Figuring out how to use a credit card to your advantage isn’t always as easy as it sounds. Knowing this, we’ve written this review of the U.S. Bank Visa Platinum to help you understand how it may or may not be able to help your financial situation. Once we talk you through each of these topics, we’ll finish up this U.S. Bank Visa Platinum review with a quick overview of the card’s pros and cons, as well as who we think is a good fit for this card. The easiest way to think about a credit card’s short-term benefits is to view them as a fishing lure. Lures are meant to coax a fish to the fisherman. Introductory interest rates and free bonus points or miles are meant to coax the consumer to a credit card. The fish who prosper and grow old can tell the difference between a lure and real food and, likewise, consumers who can differentiate between a flashy deal and a truly good credit card will find more financial stability. The U.S. Bank Visa Platinum Credit Card offers new cardholders 15 months of zero-percent interest on all purchases. You also get this interest rate on balance transfers made within 60 days of opening your account. These types of offers come with some very important details you need to know before you sign up. First, U.S. Bank will start the 15-month intro offer the day you’re approved for your card, not the day you get your card in the mail. The same rule applies to your 60-day window for 0% balance transfers. So, if you’re approved for your U.S. Bank Visa Platinum on July 1, then the timer starts ticking. In theory, you’ll have until Aug. 29 (60 days) to make a balance transfer and get the 0% APR. Even if you get your card in the mail on July 8, you’re still responsible for the Aug. 29 deadline. If, for some reason, your card arrives more than seven days after you’re approved, our research of reviews show that credit card companies usually won’t budge on their zero-interest promotion deadlines. How Does 0% Interest Help Your Purchases? A zero-percent credit card offer is a great tool if you know how to use it right. If not, then you could make a mess of the U.S. Bank Visa Platinum, kind of like how a kid with Crayons might use them on the living room wall instead of using them to color in their coloring book. First, the purchase offer: 0% for 15 months. This is an excellent tool for a few things, emergency expenses being one of them. Let’s say you’re out with friends and you slip, fall and break your arm. The hospital bill is around $2,000 and you can’t afford it. While conventional wisdom rightly says you should have at least a few thousand dollars saved up for situations like a random medical emergency, most people don’t follow the advice. So, if you find yourself stuck with a big hospital bill or another unforeseen expense, you have enough time, in most cases, to sign up for the U.S. Bank Visa Platinum, get it in the mail and use it to pay for your medical bills. Instead of having to pay $2,000 up front, you can turn that balance into manageable payments of $133.33 per month for 15 months because you aren’t paying interest. You could easily fall into the trap of buying things you want since you won’t pay any interest for 15 months, but this kind of philosophy can toss you into overspending and end up costing you quite a bit of interest once the 0% period is over. How Does 0% Interest Help Your Other Credit Card Balances? Credit cards like the U.S. Bank Visa Platinum are a popular choice for consumers who have existing credit card balances that are racking up interest. Why? Because, if you make wise choices about your new credit card, you can save a ton of money. Here’s an example. You’ve got a $4,000 balance on a credit card with a 19.99% APR. A credit card’s interest payments are calculated by determining your daily interest rate (APR divided by 365) multiplied by your daily balance. In this case, your daily APR is 0.000547. Multiply 0.000547 by your average daily balance each day during a 30-day month. Add those 30 numbers up and you get your interest payment: Around $65, in this case. There are some complexities to all this, especially if your balance changes every day. But, to keep things simple, we’ll say $65. Now, let’s assume you pay around $65 in interest every month for 15 months. Your total interest payment during that time? $975. With all that interest staring you in the face, you sign up for the U.S. Bank Visa Platinum card because you think the 0% APR for 15 months will save you money. If this is your line of thinking, you’re in good shape because you will save hundreds of dollars and we’ll explain why when we get to the rates and fees section. As we pointed out in our article comparing debit cards and credit cards, we noted that zero liability is maybe the biggest difference between the two cards. If someone makes a fraudulent purchase with your credit card, notify your credit card company and there’s a good chance you won’t be responsible for any of the charges. Your debit card’s bank, however, will hold you responsible for a certain amount of money depending on how big the fraudulent charges were. The two important numbers here are the APR and the balance transfer fee. Your APR kicks in once the 15-month 0%-APR period is over and will apply to any remaining balances as well as future purchases or balance transfers. U.S. Bank will charge you a 3% fee when you make your balance transfer. When you apply that 3% to a card with a $4,000 balance, for example, you’ll pay a $120 fee but you won’t have to pay interest on that balance for 15 months. Because you’re only paying $120 and getting 15 months of free interest, this option is a good choice if you’ve got a credit card with a $4,000 and a high APR. Why? Because if you kept paying interest on the balance and didn’t transfer it, you’ll end up making hundreds of dollars in interest payments. For example, if your $4,000 balance has an APR of 19.99%, you’ll pay more than $800 in interest over the course of 15 months. Our advice: Avoid those interest payments. Make the balance transfer and pay off your balance as fast as you can. Knowing how other experts as well as users rank the U.S. Bank Visa Platinum can give you a good mix of input on what the card’s on-paper strengths are (APR, intro bonus, etc.) as well as what the U.S. Bank customer service experience is like. The general consensus of experts other than HighYa is that the Visa Platinum is a basic card with a good intro offer and otherwise uninspiring perks and benefits. Consumers complained that there were problems with U.S. Bank’s online payment processing. In some cases, the amount due online was different than the amount due that was sent through the mail. Several customers complained that they started off with a credit limit of $1,000 and, in some cases, couldn’t move the limit higher. It’s hard to tell whether or not there’s a legitimate complaint here because credit scores and income usually play into a bank’s decision to raise or lower a limit. Without knowing this information, it’s tough to say what your experience will be. Based on what we’ve learned about the U.S. Bank Visa Platinum’s benefits and rates and fees, we’d say the card is an average one at best. It has its own pros and cons and we think there’s a certain type of consumer who could enjoy it. The best aspect of this card is the 0% intro offer, which can save someone a lot of money if they have high balances on other cards or they run into an emergency expense. Also, the card’s low-end APR of 10.99% is a really good interest rate but usually saved for those with good credit. The absence of unique long-term benefits and a rewards program really take away from this card’s value because, based on the research we did for our Best Low Interest Credit Cards of 2017 guide, there are other cards out there with longer intro-APR periods and better long-term benefits. Who is a Good Fit for the Visa Platinum? We believe the U.S. Bank Visa Platinum card is a good fit for someone who is a U.S. Bank customer and is looking for a simple credit card with a no-interest offer they can use for big purchases or to transfer a balance. There are dozens of cash-rewards and low-interest credit cards on the market that offer better intro APR periods and benefits. While we think the U.S. Bank Visa Platinum is a good fit for those who are loyal to the U.S. Bank brand, those who aren’t loyalists should stop by our credit card guide and research other low-interest and cash-back cards. Write a Review for U.S. Bank Visa Platinum Credit Card!